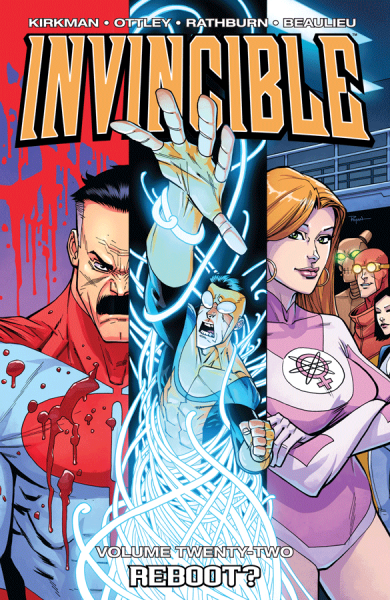 Amazon’s animated series adaptation of Robert Kirkman‘s super violent comic Invincible just landed itself a stellar voice cast. Kirkman and AMC did pretty well for themselves landed a massive hit with their adaptation of The Walking Dead, but with superheroes continuing to be a draw on the big and small screens these days, the sky’s the limit for this new project. It’s already a big win for Kirkman, but also one for Amazon, which could have seen the series head to any number of its streaming competitors. And as this voice cast strongly suggests, Amazon certainly didn’t skimp on the payout for top talent. First reported by Revenge of the Fans about a week ago, and confirmed today via press release distributed among the trades, Steven Yeun will be toplining the series as the (eventually) superheroic Mark Grayson. The series, comprised of eight, hour-long episodes, follows Mark, the son of the most powerful superhero on the planet, Omni-Man. (That role goes to the always growling J.K. Simmons.) Shortly after his seventeenth birthday, Mark begins to develop powers of his own and enters into his father’s tutelage, only to discover that the superhero’s legacy may not be exactly what it seems. While other write-ups are quick to mention Yeun’s live-action work, like the aforementioned The Walking Dead and the feature films Okja and Sorry to Bother You, since this is an animated part, it only makes sense to clue you into his work in animation. After some early video game work and a few episodes of The Legend of Korra, Yeun’s been getting steadier and steadier voice work. He had a major role in Netflix’s Voltron Legendary Defender and Trollhunters, and he continues to act on the Tales of Arcadia spinoff series 3Below, as well as Stretch Armstrong and the Flex Fighters. He’s also got some comedic chops to go with his action beats on TBS’ Final Space and in a cameo of sorts on Robot Chicken’s Walking Dead special. Yeun’s got an animated feature film under his belt as well thanks to The Star. This new lead role for Invincible has been long in the making. The supporting cast also includes Sandra Oh (Killing Eve), Seth Rogen, Gillian Jacobs (Community), Andrew Rannells (Black Monday), Zazie Beetz (Deadpool 2), Mark Hamill, Walton Goggins (Justified), Jason Mantzoukas (Brooklyn Nine-Nine), Mae Whitman (Good Girls), Chris Diamantopoulos (Silicon Valley), Melise (The Flash), Kevin Michael Richardson (Young Justice), Grey Griffin (Avengers Assemble) and Max Burkholder (Parenthood), though none of their characters have been confirmed just yet. Produced by Kirkman’s Skybound, Simon Racioppa acts as showrunner for Invincible while the pair executive produce alongside David Alpert (The Walking Dead) and Catherine Winder (Star Wars: The Clone Wars). Supervising directors are Justin and Chris Copeland (Ultimate Spider-Man). Additionally, an Invincible movie is still in the works with Rogen and Evan Goldberg writing, directing and producing the feature-length adaptation of the comic. Kirkman’s Skybound once again produces through the first-look deal with Universal Pictures. Skybound’s Alpert and co-presidents of film and TV Bryan Furst and Sean Furst are attached to both the feature and will the Amazon series, as well. Stay tuned for more!